Discover Madagascar in an interactive, immersive conservation exhibit. It's home to our lemurs and pygmy goats. The exhibit will take you through a small Madagascan village, look out for the sights and smells including a vanilla pod. You'll then enter the lemur walkthrough where you can get up-close to our mongoose lemurs, ring-tailed lemurs, red-bellied lemurs, white-belted ruffed lemurs and our newest residents the Alaotran gentle lemur. Our two pygmy goats are also housed in our exhibit. Madagascar is the only place that lemurs can be found in the wild. It's an extremely poor country with over 92% of people living below the poverty line. Local people are being forced to turn to unsustainable livelihood practices to make a living, which in turn is threatening the lemurs’ habitats. As a result, many lemur species are becoming threatened with extinction. 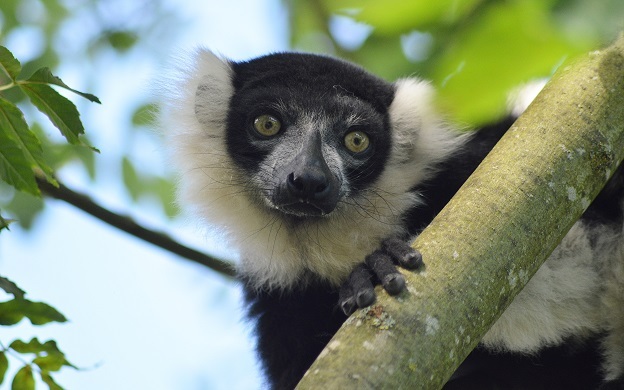 We are working to help safeguard three specific species; the blue-eyed black lemur, the Sahamalaza sportive lemur and the Sambirano mouse lemur. You can read more about the work we are doing here. Our keepers Joe and Zoe visited Madagascar in 2015, if you see them on the site make sure you ask them any questions you have. You can also learn more about the conservation work we are doing in our keeper talks. Check out the ‘What’s On’ board upon your arrival for talk times. Did you know that you can get up-close to our lemurs in their very own animal experience? Find out more here.